For the “10 Questions” series, we’re interviewing local trail folks—trail users, community leaders, company owners—with the same 10 questions about everything from trails to gear to grub. 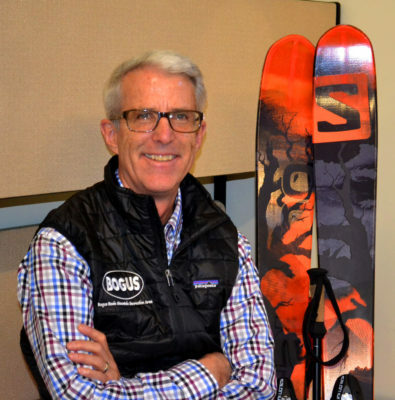 A: I’m the general manager of Bogus Basin–it will be three years in November. I started mountain biking back in nearly the beginning of mountain biking in 1986 and I’ve lived in the mountains ever since. I’ve also worked at ski areas since 1986 (except for a seven-year hiatus on Catalina Island for experience in the hospitality industry). As I moved up the ladder, so to speak, I’ve travelled around to work at different ski areas, including Vermont, Utah and at Lake Tahoe. The first real work I did with mountain biking was in 1988 with ski areas for special events and now I’ve done everything from mountain bike festivals to races. Even on Catalina Island, I set up a Gran Fondo mountain bike event, and it’s still going. And while I worked at Brian Head Resort in Utah in the mid-1990s, we set up their whole mountain bike program. We had shuttles, built quite a few more trails and created a very robust program, which continues to flourish. Q: How did you get involved with Bogus Basin? A: I moved here from Lake Tahoe for the job. My best friend lives here, and I’d been to Boise once before. This job has been the highlight of my career. In terms of trails, we are all in for mountain biking. We want to create the same type of environment that we have in the winter at Bogus Basin in the summer. I can see doing a ten-mile lap on Around The Mountain and then lapping the lift a few times and coming in to get a hamburger and your favorite adult beverage. Bogus Basin manages a number of trails, both trails that we own and trails we share with Ridge to Rivers. Originally when I came on, Ridge to Rivers still maintained and managed the trails that they built in the area, like Around the Mountain, Deer Point, and Morningstar. 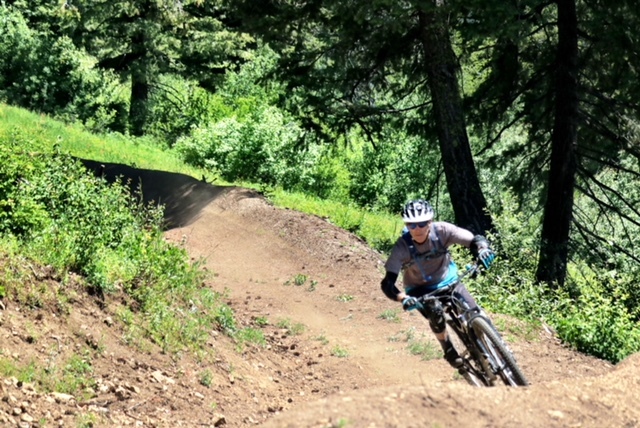 As mountain biking has become more popular at Bogus and we started opening lifts for bikes, we hired a full-time trail crew and now maintain all those trails throughout the season. Ridge to Rivers still comes in to do the major maintenance in the early and late season, and we work very closely with them and see them as a huge asset to the community. Subsequently we have built several trails that we maintain completely: Berm Baby Berm and a new green flow trail, yet to be named, that should be opened pretty soon. The new trail has a broader bandwidth than Berm Baby Berm–it’s not quite as steep and the berms are not quite as large. 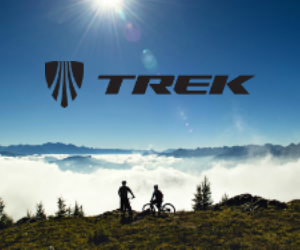 The trail requires less braking and a little less speed, and thus is built for people who aren’t as experienced. But stronger riders will have an absolute blast on the trail–they’ll just turn up the heat a little bit. At end of that trail, we have a more intermediate section that will go a mile further. And we’re in the process of building more. Two years ago we hired Trail Solutions, which is an offshoot of IMBA, to come out along with SE Group, who do resort planning, to help us identify a trails master plan. We also invited pretty much anybody involved in mountain biking, like BAMBA, SWIMBA, and bike shop operators for a collaborative session to discuss what the community thought should be next steps in mountain biking. We went out and walked the mountain, talked about what the trails should look like, and developed a master plan which identifies about 22 new trails on Bogus Basin property or in our Forest Service permit area. So, that’s how they’re determining what we want to build. That’s the short answer. The long answer is that we’re still working through Forest Service approval to build trails off of Deer Point, which is the lift we have operating for mountain biking. During that waiting period we are continuing to build trails on our private land (we own one square mile of acreage and the trails we’re building right now are on that land) like Berm Baby Berm and the new green trail. Those trails were ID’ed in the master plan, and building all the other 20 trails is probably a 10-year plan. When we get permission to make the trails off of Deer Point, the first will be a beginner flow trail and then an intermediate flow trail to start the foundations of a true mountain bike park. The idea is you can get off lift and not pedal until you’re at the bottom–thus the term flow trail. It’s possible we’ll be working on those as soon as next summer. We’ve also talked with many different bike parks around the West to find out what they’d suggest and what they’ve learned. Deer Valley said one mistake they made is that they started with intermediate and advanced flow trails. If they had to do it again, they said they’d start with a beginner flow trail and add difficult trails to that. They said you absolutely want to take care of the lowest common denominator first, so you can have families go up and ride these trails and then build off of those. Q: What do you wish people knew about Bogus Basin? A: Number one is that we are a non-profit. There are just a handful of non-profit mountain recreation areas in the country. What that means to the community is that we have a mission that we need to fulfill, and that mission is to provide affordable and accessible mountain recreation and education, and that is largely why we continue to have one of the lowest priced winter season passes in the country, particularly for the size of resort we have. It’s why we have so many different educational programs like our snow school and summer camps for kids in the Treasure Valley. It’s why we can afford to subsidize 6,000 kids coming up after school to learn to ski, and it’s who we are–we are an entity in the Treasure Valley that draws people to live here and keeps people engaged in recreation in a unique environment. 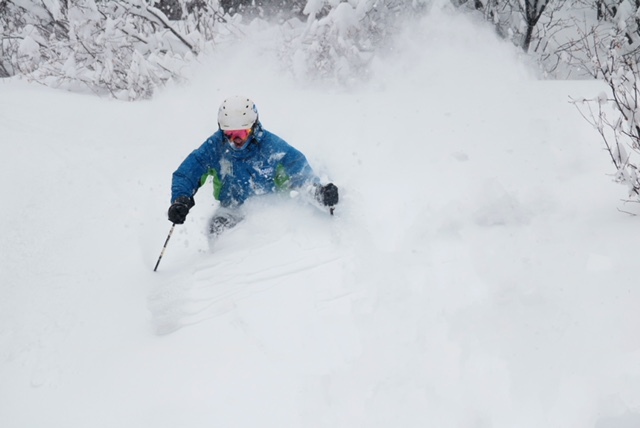 Brad in the Bogus pow. The other part of being a non-profit means that 100% of the money we make goes back into the operation. I can tell you, in my career I have made tens of millions of dollars for owners of ski areas, and you never see much money coming back to the operation. But being a non-profit last year we spent over $5 million on improvements including the mountain coaster and all the summer activities and new mountain bike trails. All of that was spent out of money we made in winter operations. Then, this year, largely because we’re a nonprofit and were able to raise some capital, we’re installing a very robust snowmaking system to the tune of just under $6 million. This was only possible because of our ultimate mission for the Treasure Valley and our desire to be sustainable. We just celebrated our 75th year last year, and we want to be here and be sustainable for another 75 years. We can’t do that without the guarantee of snow–thus the snow making–and we can’t do that without having summer operations. 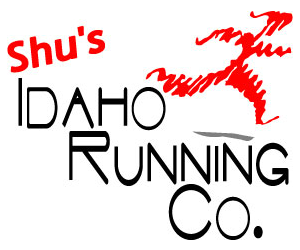 Q: In your opinion what’s the best thing about Boise’s trails? A: Accessibility for sure. I live one mile from Bob’s Trail and Highlands and not very far from Camelsback Park. To have that kind of trail accessibility from your front door is pretty amazing. And if you look at how accessible the mountain trails are–we all know it gets hot here in the summer–you can be up in the mountains so quickly and have it be 15-20 degrees cooler. The area just provides this unbelievable opportunity for people who want to bike or hike or trail run. Q: What’s your favorite trail in Boise and why? A: I would say this even if I wasn’t at Bogus Basin: My favorite trail is Around the Mountain. The variety it provides, whether it’s that initial climb up Deer Point or the great banked turns heading toward Upper Nugget, or the up and down rolling terrain on the back side–you have such a variety of opportunities. You see a huge variety of riders on it from the beginners to the hammerheads. And you get to finish with variety of choices, whether it’s Berm Baby Berm or Morningstar or the new green trail that will be opening shortly. You have some options on how to end your fun and no matter what you pick, it’s all downhill. Q: What’s your most memorable moment on a Boise trail? Q: Apart from Boise’s trails what’s your next favorite trail system/location to explore? A: The easy answer is Moab, because who doesn’t like Moab? But I spent many years riding in and around Lake Tahoe. The Tahoe Rim Trail is incredibly beautiful, technical, difficult and rewarding. It’s pretty remarkable. The trail goes around the whole circumference of Lake Tahoe–the trail itself is 144 miles long, although parts are closed to bikes because they go into a wilderness area. I typically rode on the east side of Lake Tahoe and then you always have the ability to come back on the Flume Trail. 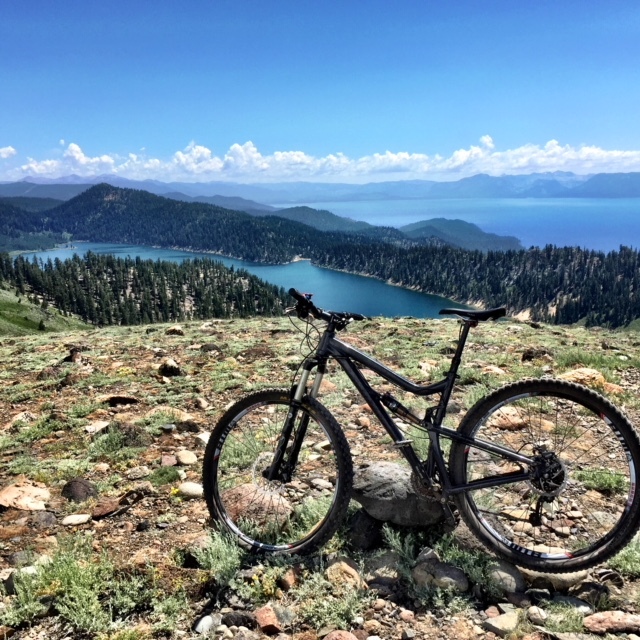 Every time you see pictures of mountain biking in Lake Tahoe, you see pictures from the Flume Trail. Basically you ride on this deserted flume, that used to carry water and timber from one end of the lake to the other. This trail is absolutely as flat as you can have in the mountain, but for a long time you’re on a cliff face where it’s 2,000 feet down to the water. It’s spectacular. I’d always try to end my biking trips with a ride back home on the flume trail. 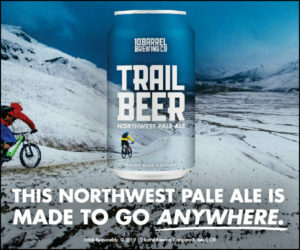 Q: What’s your favorite after-bike ride spot to grab a bite or beer? A: Hyde park is tough to beat. I don’t know if I want to pick favorites down there. It’s such a nice centrally located area, particularly from where I live. At Bogus, I typically stop and have the steelhead tacos at Double R Ranch BBQ–it’s my go-to for refueling. Q: What’s the MVP in your gear supply? A: Right now I hike because I recently broke my collarbone. 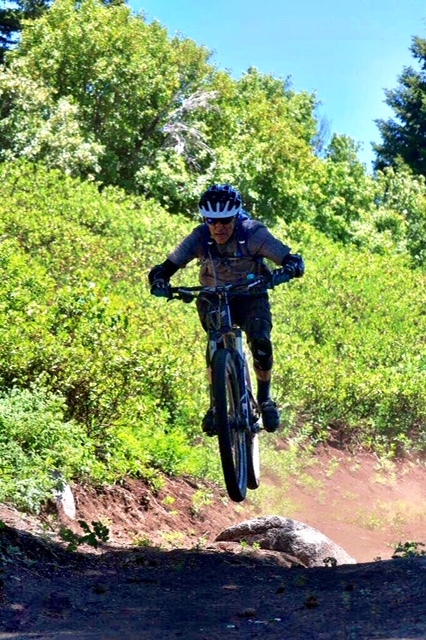 I’m typically kinda two-dimensional–I ski in winter and bike in summer. I was on my fourth ride on my new bike when I broke my collarbone, so I’m still very enamored with it. It’s a Santa Cruz Tallboy 3. Collarbones are overrated. Q: What would you like to improve or change about Boise’s trail system? A: I think with the increase in users in the foothills and at Bogus, just continuing to increase the trail mileage is important. I know Ridge to Rivers has plans including a flow trail and some pretty good cross country loops. So I think staying out in front of the amount of trails and making sure there are continually new trail designs is super important. 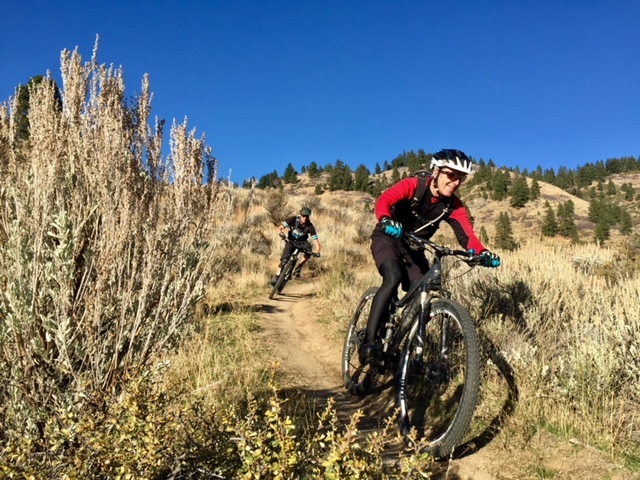 I think the growth of mountain biking, trail running and hiking in Boise is going to continue for a while, and nobody likes trails that are overcrowded. That’s where Bogus Basin can fit in and handle a lot of people. We can also be the place for special events that are tough to pull off in the foothills. When there are enduro or cross-country races like we hosted this summer, we can easily be the spot. We have parking, bathrooms and all the facilities that are needed without negatively impacting other users on the mountain as well. That’s our niche as we move forward with the active mountain bike and running communities–we want them to use us as an asset or site for future competitions and festivals. We would love to collaborate! To learn more about the trails and summer activities at Bogus Basin (they already have 23 trails at the mountain), visit their website. Great write up. Can’t wait for the new trails. I totally see the advantage of adding green or blue trails first, but hope that black and double black get added soon. There are already an abundance of green and blue. Either way thanks Bogus for adding more trails and the investment in the community!